[News from the News Center] On the morning, Apr. 2, YSU held the staff meeting at the student center, West Campus, announcing the new appointment of leadership. 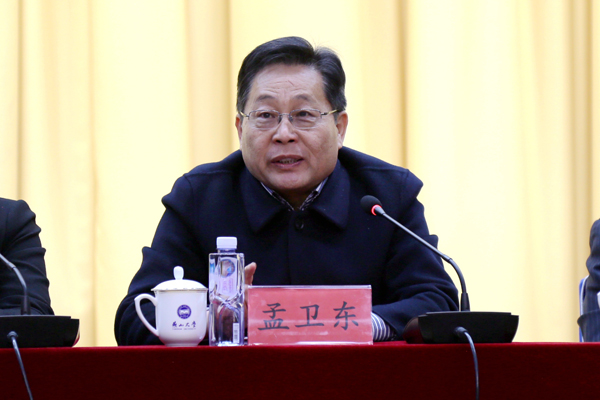 According to the decision of CPC Hebei Provincial Committee (the Provincial Committee), Zhao Xianfeng was appointed as member, standing committee member and Party Secretary of CPC YSU Committee (the YSU Committee); Meng Weidong finished the service as Party Secretary, standing committee member and member of the YSU Committee; Liu Hongmin both finished the service as Deputy Party Secretary, standing committee member and member of the YSU Committee and the service as YSU President but corresponding treatment remain unchanged. Zhao Yuexia (Deputy Director of the organization department of the Provincial Committee and director of retired cadre bureau of the Provincial Committee), Xue Bingshan (Director of the No.5 cadre division of the Provincial Committee), Huo Bingquan (Director of the cadre division of Hebei Provincial EducationCommittee), as well as YSU leaders, middle-level cadres, and those with senior titles attended the conference, which was presided over by Kong Xiangdong, standing committee member of theYSU Committeeand YSU vice president. Zhao Yuexia speaks at the meeting. Meng Weidong speaks at the meeting. Liu Hongmin speaks at the meeting. Zhao Xianfeng speaks at the meeting. 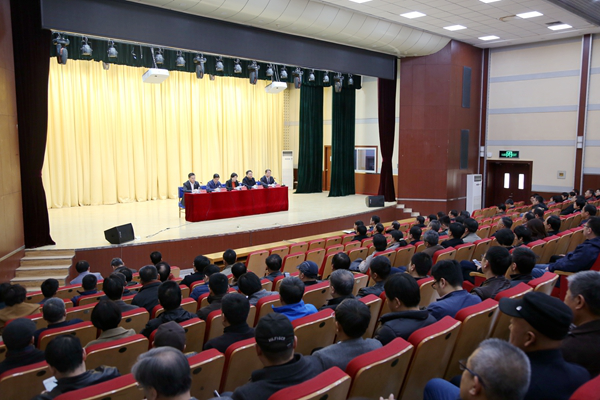 At the meeting, Zhao Yuexia announced the appointment of the Provincial Committee and made a keynote speech. She points out that the personnel adjustment to YSU is based on the development of higher education in Hebei Province and the situation of YSU, and the decision is carefully made based on the opinions, suggestions, and the consultations. Zhao Yuexia spoke highly of Meng Weidong and Liu Hongmin for their political quality and working ability. Zhao Yuexia expressed the strong affirmation of the Provincial Committee on the achievements of YSU in terms of personnel training, scientific research, social service and cultural inheritance under the leadership of MengWeidong and Liu Hongmin for 16 years, and she hoped that Meng Weidong and Liu Hongmin would continue to share their wisdom to the development of YSU. Then, Zhao Yuexia introduced Comrade Zhao Xianfeng. 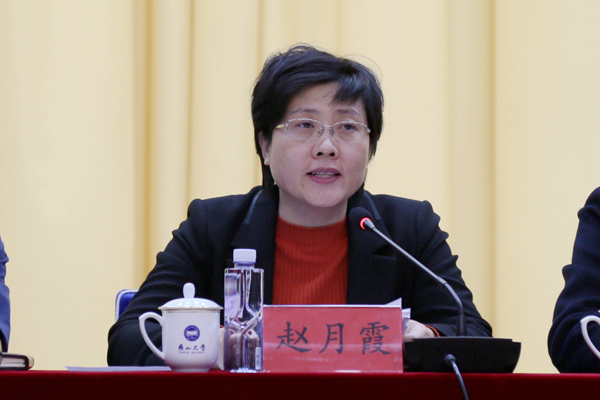 She pointed out that Comrade Zhao Xianfeng, with good political quality, has rich experience in leadership, strong ability to control overall situation and good understanding of policy and theories. Besides, Zhao Xianfeng is a leader of self discipline, cooperation, strong career-ambition, and responsibility. His appointment meets the needs of YSU’s development and the needs of its leadership team. It is hoped that Zhao Xianfeng will unite and work together with the leadership team, leading cadres at all levels, and the teachers and students of YSU to meet the expectations all levels. 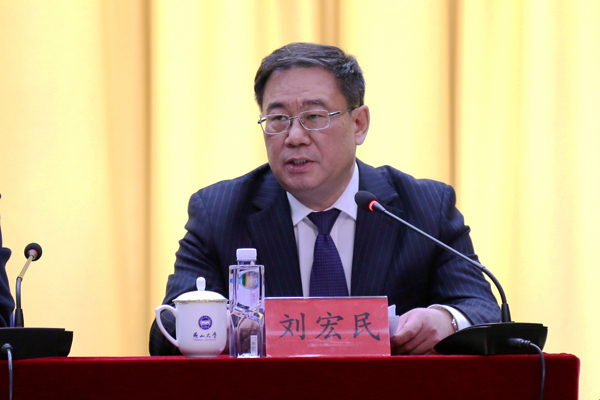 Zhao Yuexia put forward four requirements for the future development of YSU. First, we must carry out in-depth study of General Secretary Xi Jinping’s important expositions on higher education and college work. We should conscientiously implement and adhere to the Party’s overall leadership over the university, cultivate socialist builders and successors, strengthen the ideological and political work among college students, reinforce the construction of the teaching staff, support the deployment requirements of ideologyin colleges, and effectively unify our thinking and actions to the decisions and arrangements of the Central Committeeand the Provincial Committee. Second, we must adhere to the principle of enhancing the Party’s political construction. We should comprehensively promote the Party construction in the university, thoroughly implement the general requirements for Party construction in the new era, and give top priority to the political work of the Party. Third, we must ensure the transition of leadership for Party Committee in the university.We should be completely clear about the general requirements for the transition of leadership for the YSU Committee, adhere to the standards of good cadres in the new era, highlight the structure of leading groups, and we should make the congress of Party representatives a process of inspiring the Party members to take on tasks and a process of accelerating the new development of the university by forming a good report that closely follows the conditions of the province and the university, responds to the call of the era, meets the actual needs of the university, includes features of YSU, and reflects the good wills of teachers and students. Fourth, we will spare no efforts to contribute to the development of the university. We should uphold the underlying principle of high-quality development, seize the great opportunity of accelerating higher educationin Hebei Province, pay more attention to optimizing the layout of disciplines and allocation of resources, carefully plan the reform of the university, improve the reform and development strategy, and achieve sustainable developmenttaking the quality as the core. Meng Weidong and Liu Hongmin spoke respectively and expressed their firm support for the decision of the Provincial Committee and for the work of Comrade Zhao Xianfeng and the new leadership team. They reviewed their work in the past 16 years, and expressed their gratitude to the Party organization for education over the years, to the superior departments and leaders for their full trust and support, and tothe members of the leadership team, leading cadres at all levels, teachers, students, retired faculty, all sectors of society and the alumni for their understanding and support, struggle and progress. They say that they will continue to care for and support the development of YSU, and sincerely wish better and stronger development of YSU in the future. 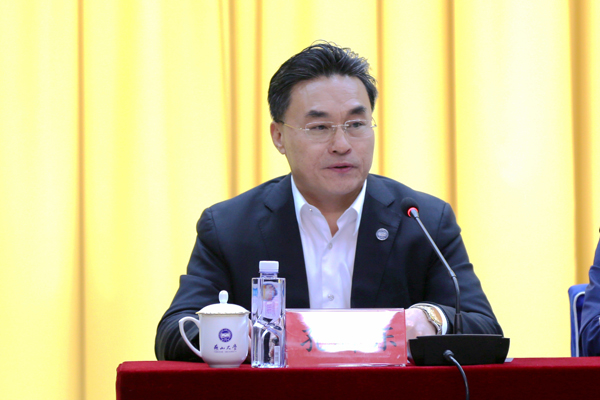 Zhao Xianfeng made a statement and said that he would firmly support and follow the decision of the Provincial Committee and he would take over the responsibility for the development of YSU. Zhao will fully inherit the glorious tradition and fine style of the university and carry forward the spirit for a better future of YSU to live up to the expectations of the Provincial Committee and the teachers and students. He says that, as the Party Secretary of the university, first he will take a clear political stand. He will strengthen his consciousness to maintain political integrity, think in terms of the bigpicture, follow the leadership core, and keep in alignment with the central Party leadership, he will increase full confidence in the path, theory, system, and culture of socialism with Chinese characteristics, and he will continue to uphold General Secretary Xi Jinping as the core of the Central Committee and the Party and to uphold the authority of the Central Committee and its centralized, unified leadership. Second, Zhao will ensure his duties fulfilled and adhere to the principal accountability system under the leadership of the Party committee, and fully support the president, leadership team members and all departments and school. He will strive to strengthen the cadres to beloyal to the Party, have moral integrity,and demonstrate a keen sense of responsibility, and to train the teachers to perform theirdutieswith good professional knowledge and dedication.Third, Zhao will pool the wisdom and efforts of everyone to achieve development. He willtake a clear political stand, strictly observe the political discipline, and stick to principles. He will be fair, decent, to maintain unity and cooperation. He will to take the lead in upholding the democratic centralism, follow the YSUCommittee’s rules of procedure and the collective decision-making procedures relating to decision on major events, appointment and removal of major cadres, arrangementfor major projects and large sums of money. He will unite leadership team member and form a consensus and joint efforts at work. 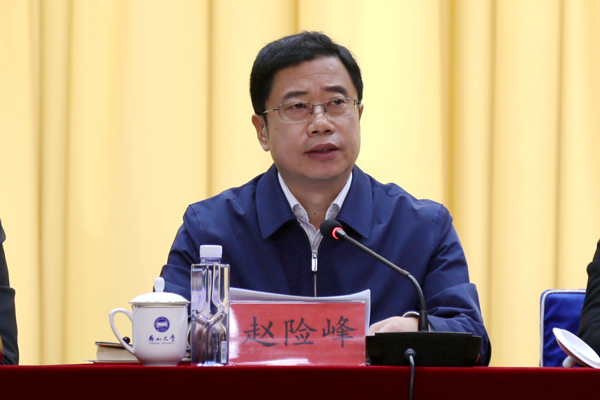 He will take the lead in implementing the Central Committee’s eight-point decision on improving Party and government conduct, follow the rules and procedures to ensure the justice and improve the political ecosystem. Finally, Kong Xiangdong made a statement on behalf of the leadership team. He says that the leadership team firmly supports the decision made by the Provincial Committee. Leadership at all levels from the university will effectively unify their thinking to the requirements of the Provincial Committee and put into actions the major decisions and arrangements of the Central Committeeand the Provincial Committee. Under the leadership of the YSU Committee with Comrade Zhao Xianfeng as the leader, with Xi Jinping Thought on Socialism with Chinese Characteristics for a New Era as the guideline, we will continue to uphold the university motto of “Social Commitment, Extensive Knowledge, and Practical Action”, and carry forward the spirit of “working hard and perseveringly, pursuing rigorous scholarship, and seeking for truth and innovation”. In addition, we will thank the Provincial Committee and all sides’ trust, support and help with better achievements and results, deliver a good report of building YSU into a “Double first-class” university and every cause of its development, and make greater contributions to building Hebei into an economically and ecologicallystrong provinces inthe new era.